Monitoring blood pressure is a vital part of maintaining health. Now theirs is an easy and accurate way to check blood pressure. 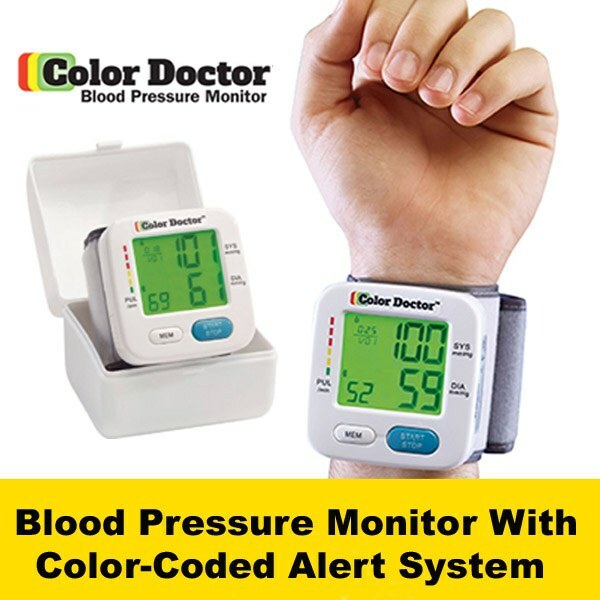 The Color Doctor is a clinically tested portable blood pressure monitor that utilizes a color-coded alert system. It takes the guesswork out deciphering blood pressure reading. Color Doctor is easy to use. Simply fit on your wrist, secure with the hook-and-loop fastener and press the button. In less than a minute, Color Doctor will display a clear and accurate blood pressure reading. The easy to read color-coded alerts are like a traffic signal. Green means normal blood pressure, yellow notes elevated blood pressure (pre-hypertension), and red alerts you of high blood pressure. Color Doctor also reads your heart rate and alerts you of an irregular heartbeat. It serves as a blood pressure log, storing up to 90 reading each for two people, plus time and date. Share with your results with your health care professional to note changes or irregularities. Uses 2 AAA batteries (not included). Color Doctor allows you to check blood pressure daily and is travel friendly. Better than cuff that goes on your arm and much faster to use.